Renewable microgrids are being rolled out in a fast growing number of remote communities and locations around the world, and utilities are increasingly keen to get in on the act. Charlotte, N.C.-based Duke Energy on Nov. 14 announced it’s proposing to install a solar-storage microgrid to serve a remote communications tower in Great Smoky Mountains National Park. Small in terms of size, the project is nonetheless noteworthy in several respects. From the utility perspective, it’s the latest prospective addition to Duke’s expanding renewable energy and microgrid project portfolio. It also illustrates how Duke is capitalizing on its investments in developing microgrids based on solar PV and advanced battery energy storage systems (BESS). Duke’s proposed Great Smoky Mountains solar-storage microgrid is one of the latest examples of how telecoms companies are increasingly turning to emissions-free renewable energy systems to replace, or augment, diesel-fuel power generation and infrastructure. Thirdly, Duke’s proposed solar-storage microgrid in Great Smoky Mountain National Park is an example of the progress being made by federal government departments and agencies as they work to achieve a goal set out by President Barack Obama in 2015. The presidential executive order calls for the Federal government to reduce greenhouse gas (GHG) emissions 40 percent as compared to 2008 levels and increase the share of electricity from renewable sources to 30 percent over the next decade. The Federal government occupies nearly 500,000 buildings, operates more than 600,000 vehicles, employs more than 1.8 million civilians, and purchases more than $500 billion per year in goods and services. It’s clear that following through and realizing the aims of the President’s 2015 sustainability executive order will ripple across the private sector, spurring investments and creating jobs. Furthermore – given they are carried out responsibly – it’s projected that realizing these sustainability goals will reduce GHG emissions by 26 million metric tons from 2008 levels by 2025, the equivalent of taking nearly 5.5 million cars off the road. In sum, all this should make for a much more energy efficient government apparatus that yields taxpayer savings from avoided energy costs estimated at $18 billion. Its budget is much smaller than other branches of the Federal government at the leading edge of the renewable energy transition – the Department of Defense and of course the Department of Energy, for instance – but the National Parks Service, not to mention the Dept. of Interior of which it is a part, can play a prominent role in promoting and contributing to a nationwide renewable energy and cleantech drive. The National Parks Service turned 100 in August this year, and the federal agency has been celebrating its centennial anniversary in appropriate style. Admission to all 412 national parks was free from Aug. 12-Aug. 28, which hosted a wide variety of special events. 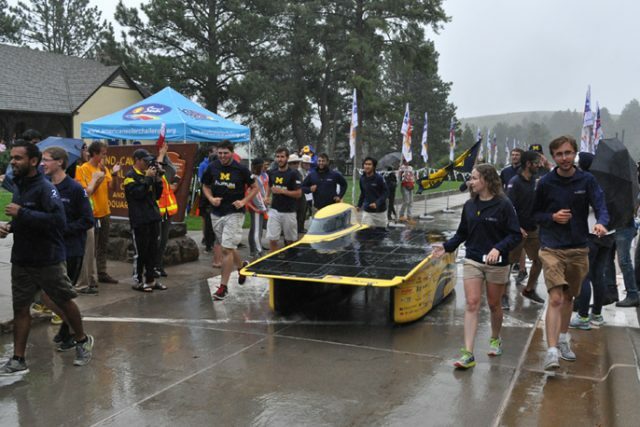 Among them college teams raced solar-powered vehicles through nine national parks from Ohio to South Dakota. Back in 2011, the National Park Service unveiled its largest solar energy system at Yosemite National Park. 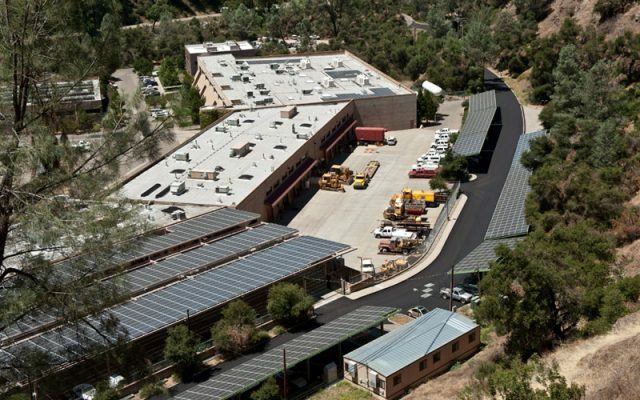 The 672-kW El Portal solar complex is the largest PV system managed by NPS in the Pacific West Region and the largest grid-connected PV system NPS owns and operates. Comprised of 2,800 solar panels, El Portal produces some 800,000.kWh (KWh) per year of emissions-free electricity, which NPS estimates saves approximately $50,000 per year on electricity purchased off the grid, along with a $700,000 energy rebate from Pacific Gas & Electric Co. (PG&E) over the ensuing five years. Duke Energy is proposing to add to that by installing a solar PV-energy storage system to serve all the power needs of a communications tower atop Mt. Sterling in Great Smoky Mountains National Park. The project design calls for installation of a 10-kW solar PV array linked with a 95-kWh Fluidic zinc-air battery. Used to provide emergency communications, it’s essential that the solar microgrid have the ability to operate independently of the power grid, Duke points out in a press release. If carried out as proposed, Duke would disconnect the tower from the overhead electric line that has been the source of electrical power. That would allow about 13 acres of park land maintained as a utility corridor to revert to a natural state. Great Smoky Mountains National Park is a participant in the Climate Friendly Parks program, a nationwide network of national parks that has raised climate-smart policies and projects to the forefront of their sustainability initiatives. NPS can’t make a decision on whether or not to issue Duke a Right-of-Way Agreement that would enable the company to move forward with construction until National Environmental Policy Act (NEPA) and National Historic Preservation Act (NHPA) compliance processes are complete. Nonetheless, ¨the park is pleased to be considered for this project, which could support the sustainability initiative,” Park Superintendent Cassius Cash said.